Happy first day of spring! After being cooped up indoors all winter, your students probably can’t wait to get outside and clock some time outdoors. 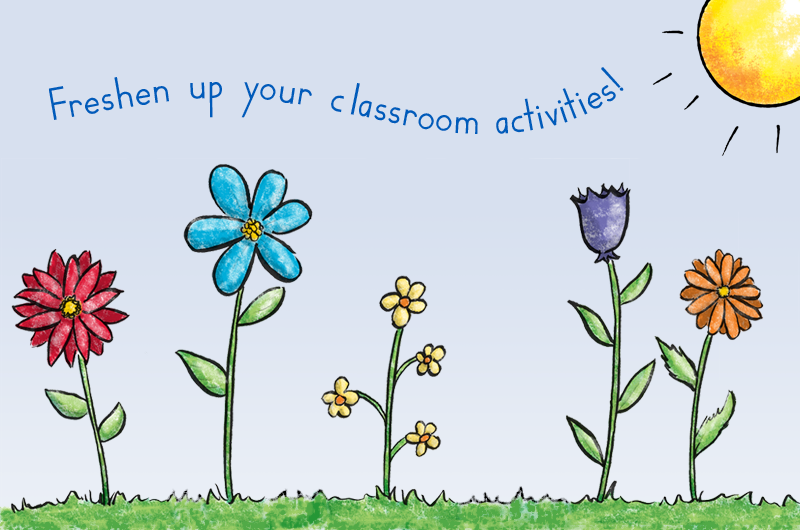 Before you open the floodgates of students onto the playground, it’s time for spring organizing and activities! So, air out your classroom and follow our simple tips to freshen up your classroom for the remainder of the school year. At this point in the year, your students might be tiring of the same old worksheets. Seasons change, so why can’t worksheets? Use our free A+ Worksheet Maker Lite to design your own worksheets to fit your needs! Crank up the volume! Whether you’re doing some spring cleaning around your classroom or teaching letter formation to your students, nothing makes it more fun than some good tunes to bop to. Incorporating music into your classroom ensures that your teaching is differentiated and appeals to all learning types—especially auditory and kinesthetic learning styles! Spring has sprung! Have your students narrate a story about what happens when winter turns into spring. Ask them to describe how nature changes around them and write it on Double Line Paper. Then, use Line It Up™ to let your students flex their verbal storytelling skills by piecing together the beginning, middle, and end of a story about spring. These activities will help children build vocabulary and verbal comprehension skills. Get organized with HITT (The Handwriting Interactive Teaching Tool™), the digital teaching platform that keeps all your teaching materials in one place! You won’t have to worry about tracking down the right worksheet on the internet or scouring iTunes for the catchiest educational music for your students. You can select from a range of multimedia options for teaching for each lesson, including digital letter and number formations, award-winning animations, music, and instructional videos.